I've been waiting a few months for the latest Baratza Sette offering to become available in Australia. Forerunners are readily available, such as the 270W with inbuilt dosing scale. But the 270Wi --the i is the difference--is supposed to have ironed out all the bugs which afflicted previous models. These are my first impressions only -- it's barely out of the box in which the courier delivered it yesterday. Certainly doesn't scream I'm a Big Commercial Beast Taking Up Lots Of Bench Space. In neither has the size nor weight to suggest it's up there in the commercial league of the ubiquitous Mazzas. Light, with the distinctive "7" shape from which it derives its name: Sette (7 in Italian). In fact, it's the only non-commercial coffee equipment I have. Assembly was quick. 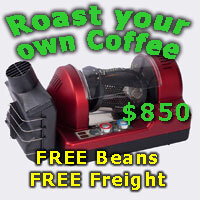 You only have to push down the hopper and, plug in the electric lead. A plastic jug is for bulk grinding, a brush is...to brush the cone grinders? a couple of shims something to do with extra-fine grinding, and a couple of hex keys, one for adjusting portafilter height, the other I don't yet know. The LED display lit up once plugged in, and I was able to work out what was what without reference to the instructions. (If a gadget has been designed well, it should be intuitive, so, ("when all else fails, read the instructions", I had a laugh). That said, the instructions are not good I am afraid. It's one of those multi-fold papers like the old Shell road maps, with the diagram and part numbers one one side, and multi-language "instructions" elsewhere. So when it says turn shut off lever (3) to 11 o'clock position....you have to refold the paper to find the diagram page, look at what item 3 is, then unfold it and find your way back to the English language section where you were reading....Not good. Now I am a big, big fan of the internet and downloading instructions. Good thing because the quick start instructions refer you to the baratza website for the user manual. People not so internet savvy might then have a problem with that. My belief is, if a gadget needs instructions, they should be supplied with it at point of purchase. So, having washed in warm soapy water the hopper, lid, plastic jug and so-called grounds catcher, off we go. I tried turning the grind setting to the recommended 9 for espresso on the macro adjuster, and F on the micro. But it wouldn't turn beyond about 20. After much fiddling which involved dropping out the bottom cone, it finally freed up and I set it to the 9F. Hit the start button, and it roared to life. Loud, but very quick. Maybe I haven't adjusted the ideal positioning of the portafilter holder, but the grounds heaped up and started spilling off onto the bench --- something Mrs Robusto frowns on because her precious kitchen sponge then becomes clogged with coffee grounds. Popped the lot into the big Grimac coffee machine and pressed play! It was a full 20 seconds before the first drop oozed out into the awaiting cup. Certainly the colour was dark and thick...but from the outset this was looking like sink fodder. After 45 seconds I stopped the pour short. Yeah, I guess you could say "drinkable" but a dose of milk would have disguised the inadequacies. As a double shot of espresso...well, the sink is in a better position to judge it than my tongue which managed to sample only a few drops before my nose wrinkled up. Now the instructions do say it will take about 4 kilos to pass through the system before it comes accustomed to the vagaries of coffee grinding. Andy will be the beneficiary of that as I am running low on beans. So, at first glance... things I am trying to eliminate in my life: has it succeeded in doing so? Shorter grind time: My Cunill is 9 seconds for 18 grams...Baratza says 7 seconds. So once a few more grams goes through the little hopper, I will update the Baratza 270Wi performance. matth3wh, gordons, JMcCee and 2 others like this. Thanks for the early thoughts review Robusto. Look forward to a follow up. I’m considering 270Wi as a second grinder. Will be interested to hear how you get on after you’ve had more time to play with the grinder. a couple of hex keys, one for adjusting portafilter height, the other I don't yet know. The larger Allen key is for when you need to shim it after the burrs settle in. Last edited by Lyrebird; 10th August 2018 at 12:31 PM. Does anyone know how this would perform for pour over? I'm looking for a new grinder and only make pour over, but I also want something a bit more high-end than a Baratza Encore or Breville Smart Grinder Pro (which a lot of people seem to be recommending). I also want something that looks a bit nicer - like a Compak K3 Touch Advanced - but apparently that's only good for Espresso. Last edited by matth3wh; 10th August 2018 at 12:35 PM. Thanks for the early review, Robusto. This is one of the machines on a slowly shortening list I have. That lack of semi-commercial quality is one of my fears although that may be an unrealistic requirement for my use. Noise is not promising. Beensean, Over the years I've had to severely reduce alcohol and coffee consumption so now I generally grind about 18 grams at breakfast...sometimes that again at night. So for me, robust commercial build is not an issue for throughput as much as a possibly issue for stability in grind quality . By contrast my other, Cunill grinder, is very heavy with very solid burr carriers and no plastic where it counts. And it's been built to grind out a large doserful without raising a sweat. Hi Robsto, I have owned the 270W for over a year now(not the i obviously). I only grind for espresso/cappuccino. It has worked quite well for me. It is noisy however it is also quick. It is very consistent on weight and within 0.1-2 grams. The one thing that is/was an irritant is the splatter when trying to grind into portafilter. I set 2 presets to make up combined 18g and tapped portafilter after first grind then finish with second half of grind. This is a pain in the A so I have the 3rd programmable button set for 18g and I just grind into supplied container, then pour into portafilter. This is an extra step however it eliminates all spatter. I have fitted one of the extra shims after 3-4 kg as required grind was down towards 2. I have now put over 25kg through and it is performing as one would expect and hope for. All in all I am very satisfied. Thanks for the great review Robusto! Please keep us updated on how you find it over time, have been eyeing this grinder off... but of course like many others they're worried about durability/longevity. Awesome to hear how clumpfree it is... even though messy! ...tapped the unsightly heap down with a couple of thumps on the bench, and they settled to the nether regions of the basket. I could tell right away the fluffy grind was going to be way, way too fine..."
I've been considering a 270WI as a replacement for my Macap M4D. I've had a love-hate thing with the M4D since the day I brought it home MANY moons ago. The M4D offers a rock-solid build, it's nice and heavy (no chance of sliding around on the bench) and there's just enough electronics to satisfy my inner gadgeteer. But, the grind retention and clumpiness drives me bloody bonkers. And the timed dosing can be wildly inconsistent. I've been using some Beurer KS51 scales (which nicely accommodate a group handle) for checking my dosing but they've just given up the will to live. So then I start reading about this "unicorn" device which could offer precise-ish doses AND fluffy grinds for under AUD700. My interest is well and truly piqued. Looking forward to updates on your thoughts/experiences. matth3wh and simonsk8r like this. Yesterday I tweaked the the setting a little towards the fine side. You are supposed to ensure there are no beans or partly ground beans in the burrs when doing this because they offer resistance, but I forgot. So I removed the burrs to remove any remnants of the week-old Behmor-roasted Brazilian pulped naturals. The burrs, as on the first day, come out readily enough. But putting them back in -- what a monstrous task that had me one step away from returning this machine. According to dowloaded instructions and Youtube videos Baratza support makes, you simply align the grind adjustment collar with a spot on the machine, push up firmly and twist clockwise to lock the burrs in. Then, continue turning to your desired grind level. Should take half a second. Well, I did that for TWO frustrating hours without success. Push firmly up, twist--- it's not the stuff of coffee-fuelled rocket science, now is it? The burrs lock in alright...but refuse to budge any further, remaining way, way off the coarse end of the scale. Funny that -- if you recall in my original post, that's the way the machine came in the first place, and only after I removed them and somehow luckily put them back in, that adjustment became possible. Over the course of two hours I became very familiar with this burr system. Mostly plastic, in three parts plus burr. The burr is held onto the hollow plastic carrier by one small bolt. Hollow to allow the grinds to drop through into the portafilter basket. A plastic tube slides over the carrier to direct grinds down. That assembly is then pushed into the adjusting collar -- the thing that is refusing to turn once I push up firmly. Pushed, prodded, removed, cleaned, re-cleaned, back to youtube, removed, replaced...rinse and repeated that a hundred times and deduced that despite appearing to seat where where they could go no more, all three bits had to go further into the far reaches of the contraption. This was confirmed to me after a few goes at putting in the stubborn adjustment collar without the burr or carrier. It locked twisted and turned then, didn't it. So, with gentle brute force--after all it is plastic we are dealing with here--I pushed that final hair's breadth which makes all the difference between push/twist success, and push/twist and shout. Unfortunately I've run out of degassed beans and only have some I roasted on Friday. This morning I dialled up 20 grams, pushed play and out they came--or should I say splattered-- in omni directions....a substantial amount on the bench, on the grounds catcher, on the arms which hold the portafilter. Heck, some even made their way inside the the portafilter basket! On the big Grimac coffee machine, the grind appeared to have all the hallmarks of a gusher --- and a very pale one at that. But the extraction managed to nonetheless take a reasonable 25 seconds. Awful, awful taste. But in hope and optimism, I put that down to the freshness of the ungassed beans, rather than the unthinkable alternative: a $626 future paper weight. There is definitely something wrong with your machine. It takes me about 30 seconds to remove, knock out and replace the burr assembly. Edit: Just timed it. 26.5 seconds. robusto, gordons and ovonate like this. I've been offered one of these at a good price (to replace my old Sunbeam EM0480) and I'm following this thread with lots of interest. So far, it doesn't inspire confidence. I'll delay pushing the button for the time being. 1. Grinding greater than 10g into portafilter is somewhat problematic with spatter/spillage. I overcame this by grinding into supplied container and then pour in to portafilter. No spillage at all. 3. Easy to clean, but can be a little fiddly putting removable blade unit back. Hope that helps - good luck with whatever you decide. matth3wh and tristanp like this. Hi TristanP Feel free to PM me the special price. Last edited by matth3wh; 13th August 2018 at 02:31 PM. robusto and gordons like this. Simonsk8r....Sorry, I don't understand what retention refers to. Matthew that looks promising. Might look into building a makeshift one for a test run at least. The splatter looks to be an on-going issue and it's quite messy. The problem is caused by the ground coffee heaping higher and higher above the basket so that the final grinds shooting down through the burrs have nowhere to go. So they bounce off the high mound and onto...everywhere but the basket. I'm disposing of them with a portable vacuum cleaner but am looking an a small cardboard tray to sit at the base and fopefully collect the stray grinds. I thought that was an interesting question so I just removed the burr assembly, brushed everything out and ran it through a #10 (coarse) grading sieve to separate out the coffee that hadn't yet made it into the burrs. Retained fines came to 2.4 g.
That's only one data point but visually it looked like the amount that I usually see when I knock out the grinder (when I'm trialling something or changing beans for instance). Maybe it would be a good practice with all grinders to throw away the first couple of seconds worth for the first grind of the day? Have never thought of that issue before. FWIW I have a small flat wooden stick with straight end (formerly supporting a Magnum, now cut and sanded to coffee-cleaning perfection) with which I scrape out excess grounds from the Rocky as part of the current dose. There will be some left in the burrs; less of a problem in that I have reduced the proportion of old grounds. Pending a new grinder, I let it go rather than throwing a little away each day. ILIOS and noonar like this. I haven't weighed the amount left behind, but it is minimal. The pictures show the removed burr assembly and you can see daylight where the grinds pass through. The potential bigger issue is that as the mound of ground beans heaps up above the basket, they bridge the gap between basket top and burrs. Something to work on--except I keep running out of degassed beans with which to experiment. The double decker attachment may not be the answer because there is barely sufficient clearance between the portafilter spouts and grinder base. On my 270w, I ground into a curry paste jar. This is the correct size to invert into a portafilter. The jar would sometimes slip, so I used a strip of tape around the arms and under the jar to support it. This provided a much more consistent dose as the vibrating unsupported portafilter arm would upset the scales. I like the idea of a paddlepop stick to probe out retained grounds! I used a cable tie with a bend in it. The unknown Allen key is used to undo the burr to install the shim/s. The lower burr carrier is no where near as hard to install as described. Perhaps the poster has limited mechanical aptitude, in any way, he is gaining it now! I kept maybe 100g beans in the hopper. Grind my dose. Then invert the whole machine to get the beans back into the hopper, shut the hopper trap. Revert machine, Grind the remaining beans caught in the burrs, clean the 6 little holes shown in the post above, remove hopper to the pantry for next time. I found the 6 holes would retain grinds and clog. Limited mechanical aptitude? Mois? Err...hardly. OK Robusto, we can see you can do the easy stuff, but have you ever tackled anything really challenging like change a 270Wi lower burr carrier! In my new house the power kept going off intermittently. Finally I located the problem to loose wiring at the fuse box. My central heater blower started making a racket...Located the problem to a loose bolt which secures the blower to the fan armature so that it spun off balance. Yes, I am forever having to diagnose and undo the sloppy work that people with supposedly better skills than me make my life...interesting. RavenMad and 338 like this. My 270WI arrived earlier this week. Made use of a 15% off eBay coupon to get it for $567.50 delivered. - The auto-correcting ("AI"...derp) dosing is like magic. Only downside, really, is that looks/feels a little cheap. But it's *half* what I originally paid for my Macap M4D so I wasn't expecting the build of an Audi for the price of a Kia. simonsk8r and ovonate like this. Sounds like an advert for EBay. Could anyone comment on how "noisy" this grinder is, relative to a Rancilio Rocky doserless? Interesting the i has auto correcting/learning weight measuring. The normal 270w version always doses within 0.1g and often is dead on. My exact experience! Unfortunately cannot live with noise, poor build quality, Burr wobble, misalignments, spillages, reassembly issues Goodbye sette 270 wi! Good post BTW. Shame I missed this post before purchasing! Would not have bothered! I found grinds stuck in the top assembly between the outer but and it’s plastic carrier were the problem. You need a thin paper clip to clean around the outside of the bur then it goes all the way up easily. I think it’s on their website faq also.